Wait – it’s the author of this article in the Global Times that draws the comparison of an outrageous show for kids at the Summer Palace with Quentin Tarantino’s film. And the analogy is spot-on. This is wild and crazy stuff. The lotus flowers are in bloom at the Old Summer Palace, a magnificent royal compound destroyed twice by foreigners, in 1860 and 1900. This catastrophic loss to the world’s cultural heritage occurred more than a century ago, but the ruins loom large as a central symbol of China’s humiliation at the hands of Westerners. I saw first-hand an example of how this sense of indignity and outrage is kept alive during a stroll on a summer evening, when I stopped and watched the shadow puppet show The Legend of Yuanmingyuan. ….Watching the show, I was confused by what was happening before me. In battle after battle, Chinese soldiers and villagers used martial arts and tricks to defeat the buffoonish French and British invaders. The foreigners got hatchets in the face, spears in the eye, and bayoneted repeatedly while lying helpless on the ground. Wily Chinese fighters jumped into the air, causing foreign troops to accidentally kill each other… I was wondering if I had stumbled upon China’s answer to Inglourious Basterds, the Quentin Tarantino revenge fantasy in which a group of Jews scalp dozens of Nazis and then kill Hitler. The delightful show has an obvious intent: to generate in impressionable children as much rage against foreigners as possible. To the laughter of the children and adults in the audience, the solders mispronounce the names of their own countries, for example, saying they are from the country of “Epilepsy” rather than the near-homonym Great Britain. During one comical scene, soldiers fight over the loot from the Old Summer Palace, staggering like drunkards with their heavy load. The soldiers, played by real pint-sized actors on stage, are so venal that they reach off the stage into the crowd to find even more things to steal, grabbing at audience member’s mobile phones. One foolish soldier, intent on stealing everything that isn’t screwed down, burns his hands trying to steal one of the stage’s footlights…. One of the most disturbing things about watching this spectacle was seeing little people teaching little people how to hate. At the end of the show, the children in the audience were invited onstage to pose with the actors. To my surprise, it was announced that the performers were not children at all, but adults suffering from dwarfism, with an average age of 22 and an average height of 1.26 meters (4 feet). Their particular form of dwarfism makes them resemble children. Kudos to the Global Times for running a piece that makes this look like the cheapest, most vulgar and nauseating propaganda. As the writer points out, the park’s Chinese and English web sites have very different copy. The hysteria and anti-foreign sentiments somehow got airburshed out of the English translation. Hatred, like forgiveness, can be taught, and hanging on to hurt and outrage is the central message of this show. To be sure, a clear-eyed look at the history surrounding the Old Summer Palace and the collapse of the Qing Dynasty offers many lessons in arrogance, barbarism, and how regimes rise and fall from power. These lessons are valuable today. But these lessons were far from the caricatures of history I witnessed in this show. Beyond the looting and destruction of the palace by foreigners amid war as the Qing emperor fled, there was little in the way of history. This puppet show, of course, is hardly unique, but instead a very normal example of the methods by which past hurts are nurtured for purposes that have nothing to do with understanding the past and everything to do with fueling nationalism. The looting of the Summer Palace is one of those third-rail topics that I learned long ago to avoid at all costs. It’s one where I’m tempted to use the “b” word (it rhymes with “train quash”), and this show confirms it’s justified. The looting was a shameful thing. But to carry that much anger in their breasts nearly a century and a half after the fact is bizarre. But it’s not bizarre – it’s cultivated at a young age when kids are at their most impressionable, and it perpetuates the stereotype of victimhood and keeps it fresh and raw. A friend of mine once talked about it to me with tears in her eyes, as if it happened last week. I just listened, knowing there was nothing I could say except that I understand and sympathize. A great post by one of my favorite bloggers on why Popup Chinese is one of the best ways to study Mandarin. And I agree with him. The China blog is officially dead, moribund, cadaverous, extinct, buried, bereft of life, defunct and totally-and-utterly-inert. It could even be said to be resting in peace, save for the fact that Will Moss drove a silver stake through its heart before recording this podcast. “We single-handedly made the China blog obsolete,” he joked in our studio after further sawing off its head. But he has a point. Because who reads blogs these days? Does anyone even remember the China blogs of days past? Back then there were greats like Peking Duck, ImageThief, Sinosplice and Danwei, and you could even indulge in a little China-bashing at Talk Talk China. Then came Sinocism and EastSouthWestNorth, and then the mainstream media blogs from magazines like Time and journalists like Malcolm Moore, Peter Foster and Tom Lasseter. And then the explosion of blogs like the Shanghaiist, China Geeks, China Hearsay, ChinaSmack, ChinaHush and CNReviews, not to mention the more eclectic and academic writings of China Youren, Jottings from the Granite Studio, In the Footsteps of Joseph Rock and The China Beat? Well… we’re sorry to be the bearer of bad news, but all of these blogs are dead. Or that’s the opinion of the curmugeons in our studio this week: Kaiser Kuo, Will Moss and Jeremy Goldkorn, veteran bloggers in China who’ve seen the ups and downs of social media and are prepared to tell it like it is. So join us this week on Sinica for a dissection of the Chinese blog scene. And then get the hell off our lawn. What is it with kids these days anyway? Obviously this is something that’s been on my mind as I try to keep my own blog going. Twitter has obliterated what I used to use the blog for, namely sharing links and offering some commentary. And the China blogosphere is so fragmented it’s much harder to be heard above the din.The fact that I’m caught up in my own issues (I’m planning to launch my own small business soon; I’ll keep you posted) hasn’t helped make this blog more productive. But even if I were as productive as in 2003, the site would be in decline. China blogs are too many. and blogging in general is becoming increasingly antique. I do miss the “golden age,” from 2003-2005, when I could open a thread before bedtime and wake up to 300 comments. But that required full-time posting and, at its peak, the help of three or four other bloggers all putting up copy throughout the day. At least I’m not alone. Danwei, Imagethief, Fool’s Mountain – nearly all the blogs have seen some decline, according to the podcast, even the journalists’ blogs. My posts are now appearing on a very neat new site. Please be sure to check it out. Richard McGregor’s book The Party: The Secret World of China’s Communist Rulers, is yet another must-read book on contemporary China and probably the single best book on the CCP you can find. I can’t say there was anything truly shocking to be found in its pages, but maybe that’s because there’s nothing the CCP can do that would shock me anymore. What McGregor does beautifully is demystify the CCP and its “relevant organs” through a masterful combination of anecdote and analysis that keeps the book taut, even exciting. His now-famous description of the “red phones” that sit atop the desks of 50 or so ueber-elite Chinese executives, and all that the phones represent – secrecy, privilege, control – is a great example of why this book is so entertaining, even when it’s scary. I love the way McGregor writes. China under Mao Zedong had much in common with other totalitarian systems. To borrow the oft-used phrase, terror was the system for extended periods of Mao’s rule. In the last three decades, the Communist Party has turned that formula around. Terror is just a side effect these days, used relatively sparingly and, in large part, reluctantly. In modern China, the system runs on seduction rather than suppression. It aims to co-opt, not coerce, the population. But even so, terror remains essential to the system’s survival and is deployed without embarrassment when required…. [This resorting to terror] is evidence that behind the Party’s boisterous, boasting exterior lies a regime with a profound appreciation of its limited legitimacy and fragile mandate. The book is rich in examples and clear-headed analysis of an array of (relatively) recent phenomena – the San Lu cover-up, the institutionalized corruption, SARS, the harassment of lawyers, the hyper-paranoia over public perception of the party. And it is remarkably balanced. McGregor never portrays the Party as evil, though it is certainly something to fear. I’m not formally reviewing this book because there are many excellent reviews out there and I can’t add much to them. I did want to focus briefly, however, on one chapter that captivated me, titled Tombstone, about a book of that name written by a former Xinhua journalist, and one who was particularly high up, Yang Jisheng. For me, this was by far the most intense chapter in this whole intense book. One of the most popular fenqing arguments, and one I’ve heard from Western friends as well, is that the estimated 30-40 million Chinese who died in the famine during the Great Leap Forward was a number pulled out of thin air by CCP-hating Westerners, and that the number bears little correlation to the facts. Sometimes I wondered myself; I had read that the estimate of 35 million dead was from Chinese sources, but it wasn’t until I read this chapter that I fully understood where the number came from and how it was arrived at. On events such as the Great Leap Forward, the Cultural Revolution, the suppression pf the Tibet uprising in 1959, the pro-democracy protests in 1989 and so on, the Party simply announced it verdict after intense deliberations. Party officials are bound by these pronouncements on history, whatever they think as individuals…You either support the decision wholeheartedly or you are out. The Party’s verdict then, in theory, becomes the collective opinion of the entire country and its 1.3 billion people. Chinese who wish to agitate publicly for an alternative view do so at their own risk. And yet Yang wrote and published Tombstone (in Hong Kong – two volumes, more than 1,000 pages) and he was not punished. Needless to say you won’t find many copies of it for sale in the Mainland, but Yang was never arrested or even harassed. China simply doesn’t do that anymore, McGregor explains. If you aren’t directly threatening today’s CCP with threats,real or perceived, that might undermine its power, you can pretty much say what you want (and I know, there are some egregious exceptions). The descriptions of what the peasants endured during the GLF, familiar as they are, are still heartbreaking. And forget about the line that it was simply another naturally occurring famine. No, not at all. It was a man-made event, and had it not been for Mao and his ego and his dogma it wouldn’t have happened. I wrote in the margins of every page in this chapter. It was a scene of mayhem and death and cannibalism the likes of which we can never imagine. I had read about Tombstone last year, but never knew the full story behind it. Its publication highlights the Party’s increasing toleration. But always, of course, within limits. I meant for this to be a very short post and seem to have wandered all over the place. Bottom line: Buy the book if you want to really understand how the Party manages to keep on going, and how its mind works, complex and secretive, yet almost always predictable. China has long known something that many in developed countries are only now beginning to grasp, that the Chinese Communist Party and its leaders have never wanted to be the west when they grow up. For the foreseeable future, it looks as though their wish, to bestride the world as a colossus on their own implacable terms, will come true. That should get each of us thinking. Like it or not, China continues more than ever to shake the world. If you attended the Peking Duck dinners I used to organize in Beijing you most likely were left with a strong impression of one attendee, Joseph Bosco, the mustachioed professor who wore the big white hat and talked with a debonair Southern accent; the one who could effortlessly spin yarns and entertain, and who always seemed to have an interesting perspective on any issue that arose. The last time I saw him was nearly a year ago to the day, at my farewell party in Beijing. He was looking frail but in his usual good spirits. I spoke with him on the phone just a few days ago, and I was not surprised to learn tonight that he’s gone. Joe’s blog used to be one of my favorite reads. He was an old-school liberal and a man of the people. When I contacted him in 2003 and asked if he could do me the huge favor of meeting for one hour a week with a good friend of mine from the countryside to help him improve his English, Joe didn’t hesitate. I can never forget his generosity. He changed that young man’s life and gave him a strong sense of pride and dignity. Joe was a character; no one I know had so much “personality,” and I mean that in a good way. He wasn’t perfect (who is? ), and watching things get worse for him over the past few years was a sad thing. I encouraged him to write some columns for the Global Times, which he did very well, but then his health issues made that impossible. More than anything else, this blog ushered into my life an entire cast of characters so remarkable and so wonderful I have to consider myself blessed. Some disappointed me, some exceeded my wildest expectations in terms of generosity and kindness. Joseph was at the very top of that list of extraordinary people. I’ve never met anyone like him, and never will again. Even with his issues, Joe was always one of the good guys. He changed my outlook on the world and he inspired me. I’m sorry he is no longer with us, and I hope that after years of sickness and pain he is finally at peace. Finally going to NYC for the first time in years. Posts will be few and far between. I’d suggest an open thread, but without our resident trolls comments have been sparse. If anyone wants to guest blog…. 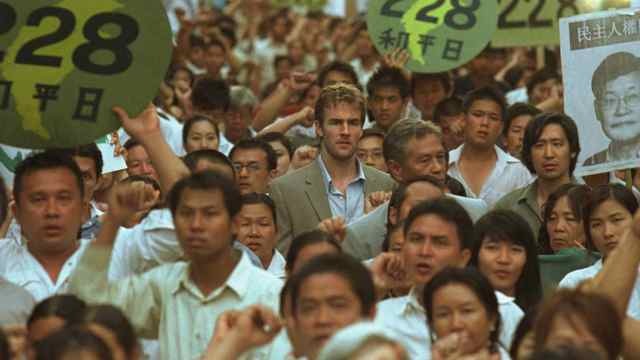 On August 6, the 2009 thriller Formosa Betrayed will be seen for the first time in Taiwan, about two weeks after it becomes available here on DVD. You should all see it, and remember that Chiang Kai Shek had nearly as much blood on his hands as Mao, and not very long ago Taiwan was a brutal police state capable of unspeakable crimes against humanity. I watched the movie last night. It stars Dawson Creek’s James Van Der Beek, and despite its obviously low budget – it lacks the slick veneer of a Hollywood blockbuster, and has none of the dazzling effects of, say Silence of the Lambs – it still sizzles. Inspired by two actual events, one surrounding the death of Professor Chen Wen-Chen (陳文成) of Carnegie Mellon University in 1981, and the other the 1984 assassination of journalist Henry Liu in California, Formosa Betrayed is the story of FBI Agent Jake Kelly’s (James Van Der Beek) investigation of the murder of Henry Wen (Joseph Forunda), a Taiwanese professor in Chicago. With the help of his partner Tom Braxton (John Heard) and a sharp Chicago police detective (Leslie Hope), Agent Kelly discovers that the murderers have fled to Taipei, capital of the Republic of China. Agent Kelly is sent overseas to assist the Republic of China government’s search for the killers. Initially guided by an American diplomat (Wendy Crewson) and a KMT official (Tzi Ma), he soon realizes that not only is he an unwelcome guest in a foreign land, but that something more treacherous is happening beneath the surface. With the help of Ming (Will Tiao), a Taiwanese activist, Agent Kelly discovers the unsettling truth about the island, once described as “Ilha Formosa” (“beautiful island”) by the Portuguese, leading to dangerous and painful consequences. Agent Kelly finds himself on a collision course with the U.S. State Department, the Chinese Mafia, and ultimately the highest levels of the Kuomintang, where this FBI agent discovers how a complex web of politics, identity, and power affects the lives and destinies of all the citizens. I had to smile when, early on in the film, Agent Kelly checks into a Taiwan hotel and is handed the keys to Room No. 228. It’s a shame that just about no one knows what 228 is, about how on that day, February 28, 1947, an incident took place that would unleash the full savagery of the Chiang Kai Shek regime, resulting in the wanton slaughter of as many as 30,000 innocent Taiwanese citizens. It was a tragedy that makes Tiananmen look trivial. It is shocking that it remains unknown. But to Taiwan’s credit, it is a great weight on the nation’s conscience, and everyone there knows about it. It took decades before the government opened up about it, but now there is an Er Er Ba park and museum with photos of the victims and all the sordid details, and it is a source of shame and grief to this day. This is heartening, though of course it doesn’t excuse or lessen the crimes committed by Chiang’s willing executioners. Formosa Betrayed is based on an all too true story, and your blood pressure has no choice but to rise as you see how the US State Department in effect allowed the Taiwanese government in 1981 to murder a US citizen critical of its regime, and to then cover it up by murdering its own assassins. Along the way, those trying to help bring the truth to light are murdered, and one of them, in the film’s most disturbing scene, is tortured with a blowtorch. There is a propaganda element to this movie, which is clearly an advocate for Taiwanese independence. It makes the point that Taiwan has been exploited for centuries, ruled by the Japanese and then by Chiang (at first welcomed as a hero), and that the fate of the island was then put into jeopardy by the US’s recognition of the PRC. Shouldn’t this country, the film shouts at you, be allowed to be independent? That, of course, is a thorny question and there’s no way for me to discuss it without feeling depressed, because I sadly do not believe it’s going to happen. But no matter what our viewpoint on that subject, you should know the Taiwan that has somehow been airbrushed from modern memory. You should know with what casualness and cruelty Chiang’s army murdered the people of Taiwan. And you should know that, once again, in the name of “pragmatism” the US in 1981 allowed them to get away with murder. It’s a taut, well-made movie that will leave you furious. Van Der Beek is actually quite excellent as the hero who will not compromise in the name of realpolitik, and the man who fought to make this film possible, Will Tiao, is absolutely superb as the poor fellow who tries to help Agent Kelly find the assassins, and who ends up facing a gleefully sadistic torture crew. He is also the film’s writer and producer. If you’re in Taiwan, please spread the word that the film is coming and must be seen. If you’re not in Taiwan, rent the DVD and see a side of Taiwan we all want to forget. Today, Taiwan is simply my favorite country on earth, civilized, urbane, wonderful in just about every way (politics aside). It is so hard to believe that only three decades ago people advocating independence were being shot openly on the streets. You can’t know contemporary Taiwan if you don’t know the Taiwan of the nost-so-distant past. US and China heading for an ugly trade war? If you’ve been watching the financial news over the past few months I think you’ve probably picked up on a powerful new message that’s being broadcast by Corporate America: things aren’t going well for US companies in China, who are just about fed up with government restrictions and shenanigans that make it impossible for them to compete with their Chinese counterparts. This has always been an issue. In the past, however, Corporate America kept its unhappiness to itself and held big media events to show how happy happy happy they are to be doing business in China and how committed they are to the Chinese market and how thrilled they are at the opportunity to pour billions of investment dollars into China’s coffers. American companies simply loved to do this. Of course, those who listened behind the scenes always knew this love was – how shall we put it? – insincere. The companies were simply fuming at the hurdles and land mines strewn in their path, nonsense that made competing with home-grown Chinese companies next to impossible. The foreign firms built research parks and came up with cool programs for the kids in their neighborhoods, science fairs and contests and tree-planting and other love-ins. They appeared at elaborate press conferences with local officials, and somehow they’d usually get someone from the MII to attend and validate their event. There were photo opportunities, long handshakes, lots of smiles and applause. But the winds that are blowing now indicate trouble in paradise. More and more stories have emerged in the past few months about growing frustration on the part of Western companies, and increased arrogance on the part of the Chinese officials. This is not entirely surprising. After all, it’s the US that, more than any other party, brought us the economic catastrophe, and the irony has been noted again and again that after being asked by Chinese banks to help them modernize and get organized, it’s now the US banks coming hat in hand to China. This turn of events has given the Chinese a lot to gloat about. So you have two opponents in the corners of the ring, frustrated US companies at wits end over getting nowhere in China, and a haughty, super-charged China feeling stronger and mightier than ever before. THIS week’s plain-speaking prize goes to Jeff Immelt, the boss of General Electric. He argued that China is increasingly hostile to foreign multinationals; he also gave warning that his company, the world’s biggest manufacturer, is actively looking for better prospects in other emerging markets. “They don’t all want to be colonised by the Chinese”, he said, going rather further than was prudent. “They want to develop themselves”. Mr Immelt’s broadside was undoubtedly significant. It reflects a growing mood of disillusionment with China among big Western companies. It came from the mouth of one of China’s biggest boosters, a man who praised the Chinese leadership, only last December, for doing exactly what they say they will. This is important. Immelt IS (or was?) a breathless “China booster.” For him to suddenly bare his teeth and say what’s on his mind like this tells us – well, it’s no accident that he did this. That same blog post goes on to question Immelt’s stand and points out some Western companies have successfully “cracked the China code” and are making money there. But I think a lot more are struggling there. I can’t prove it, but I certainly know of some very big businesses that are as fed up as GE. And that brings me to this article, which predicts a total trade war. The author contends we are heading toard an “imminent showdown,” and I don’t doubt it. A significant part of China’s rapid growth has been driven by its ability to export its goods to countries such as the United States. In turn, the U.S.’s ability to continue to finance its massive $13 trillion federal deficit has been substantially underwritten by China’s ongoing purchase of U.S. Treasury debt. While each side has gained from this relationship it is charting an unsustainable trajectory that could lead to severe problems. This is particularly troubling because Chimerica tension is rising over China’s currency policy just as many countries — including the U.S. with its high unemployment and China with its property bubble and inflation concerns — appear to be struggling to emerge from the ‘Great Recession’…..
Chinese have been driving a very hard bargain with the rest of the world with their managed currency policy. China has benefitted tremendously from joining the open world economy. However, free trade is not an inalienable sovereign right. China’s growing economic power comes with the role of being a responsible global actor by playing by the same rules as its trading partners. The U.S. has grown weary of waiting for the Chinese government to come around at a time when it is also economically weakened. In short, the time has come for the renminbi to be revalued upward or U.S. action will occur. China’s leadership, emboldened for example by the failure of the U.S. to navigate the world away from a near financial collapse and Google’s recent blink, is growing more confident. It is reasonable to assume that China will increasingly flex its economic muscles and may reject the U.S.’s request for a change in its currency policy. The Chinese government stubbornly detests public pressure from foreign government officials. Yet the Chinese leadership appears to only move when they are forced to do so. And often when they do finally make a change, as with the most recent renminbi move, they barely budge. At the same time, it is highly unlikely the U.S. will quietly surrender its role as the world’s dominant superpower. And the pressure is growing to take swift, assertive action on the renminbi as calls to “do something” grow louder in the face of a deteriorating domestic economy. China — similar to Japan in the 1980s — is directly in the U.S.’s economic crosshairs. The inescapable conclusion is that an escalating U.S.-China economic war is not only underestimated in terms of its likelihood, but probable. Sorry for the long clip, but I think this is an important story. Maybe it’s just another example of pack journalism, with everyone making a lot out of some circumstantial evidence and all of them pointing in the same direction and shouting the same accusation: “China’s pushing the envelope and pretty soon there’s going to be a rupture; something’s got to give.” It will be interesting to see what happens next, after watching the tension build up for so many months. I can'[t make any predictions, except to say that China seems to have the upper hand, fair or not.